With the growing popularity of computer / home theater integration, there is one thing that most people find missing in the mix. It's probably the most common piece in even the cheapest video or audio component these days. What is it? A remote control. 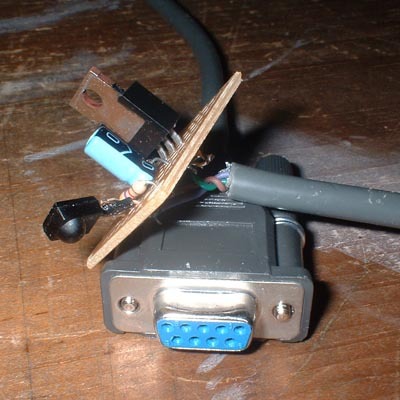 In this guide I'll go over the basics of building and programming a remote for your PC. What's nice about a PC remote is that although it takes some work to get set up, the possibilities of what it can do are only limited to your imagination. Changing resolutions, opening applications, and locking your computer through windows are just examples of what is capable with a remote control and a little intuition. Before we begin, lets see what you'll need software wise. WinLIRC is the nitty gritty, behind the scenes type program that you will be using. Girder builds upon WinLIRC commands to automate various tasks for your computer. The WinLIRC Plugin for Girder is also necessary if you want the two programs to communicate. Note that most of these items can be picked up at any Radio Shack. The serial connector and 3-conductor wire can be replaced with a serial cable, if you have one. Just use a multimeter to figure out which pin goes to which cable after you cut the sucker in half. Also note that it seems as if the Radio Shack IR Module (part# 276-640) will not work with this project. I have tried two separate modules and could get neither working. If you can get one to work, please let me know. I followed Petri Damstén's circuit layout because I believe he did a very good job in keeping it simple and compact. Clicking the image or his name will take you to his page where he placed the receiver into a TIE fighter, a creative way to hide away the receiver and give it some aesthetic value. 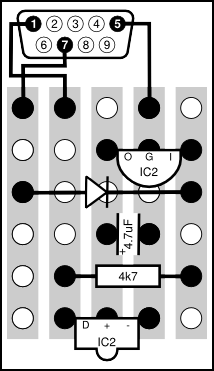 It's important to remember that depending on the type of IR module you purchase, you may need to cross leads on it to match the circuit design. Make sure you check the pinout of your components before soldering them into place.